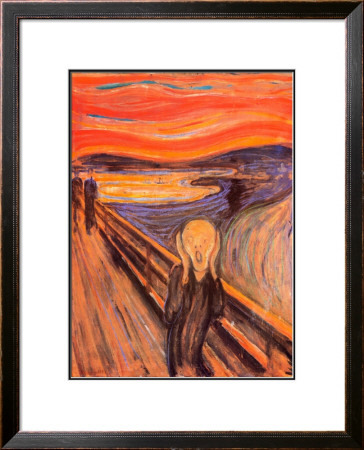 Have you heard about the recent high dollar amount paid for the painting of the scream? It brought in the highest dollar amount paid for a painting to date? The scream is a touching and thought provoking painting I feel everyone should consider as it depicts the human condition and emotions we all have in common. Edvard Munch's famous "The Scream" painting is one of the world's most commonly and highly recognized works of art to date. Maybe it's the familiar human emotion connecting each of us on the globe, the feeling of pain, sorrow and hurt producing such a scream, one we are all familiar with. There's that one point in time where in we all feel the intense desire to scream as is depicted in this famous and touching image. 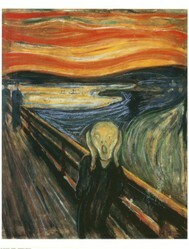 The Scream sold for one hundred twenty million dollars making it the highest earning painting sold to date. The Scream depicts a man in a dark yet private moment of anguish, anxiety or despair, while surrounded by others in the painting who seem blissfully unaffected by the man's extreme display of pain and agony. This reminds us much of our own lives as often it seems no one cares, everyone is to busy to imagine the suffering of another human being. The world around this man is all consumed in their own driving force that which is anything benefiting themselves with no time to invest in another. There is a world void of compassion in this depiction of the fragile human state one of a chilling cold loneliness. The Scream painting is a self portrait of its creator who produced many different versions of the original. How moving as pain frequently visits us throughout life and yet the degree of pain varies. More to the point the degree to which we feel and react to pain evolves as we grow in both age and wisdom. Is it the wisdom we obtain that intensifies or lessens this pain. All these questions come to mind while I, an art lover, look upon one or more of the variations of the scream. I note the slight yet obvious changes in the emotion of this painting as the artist no doubt feels a reflection of the original pain causing him to create such a painting. His muse was pain, continued to be pain as he exercised the pain over and over. Was this an attempt to remove the pain from himself or work it to exhaustion till he could be free of the pain. What caused the artist such suffering, torment and anxiety? We may never honestly know for what reason he shared this scream to all humanity. Do any of us honestly share the real source of such pain, or do we filter it, sensor it for others and only do so as if we do not it may very well destroy us from within? Edvard Munch is the famous creator of The Sream. He was born in 1863 and died in 1944, he was Norwegian. Munch did several varying versions of "The Scream," what I feel to prehaps be an alter ego of or maybe for himself The scream was created in oil, pastel, and litohgraph. I love this piece of art and feel many can gain great insights into themselves and the world around them by considering the scream honestly and without caution. Really look into yourself and embrace the scream looking to escape. Derdriu, I enjoy Scream Immensely! katiem2, Great idea! Like you say, the emotion, the person and the topic must have been important to Munch since he made different versions that have been aesthetically and financially significant enough to have been burgled and recovered a number of times! Munch, munch, munch...not for me this scream. I am more of a Magritte fan. But, as usual, a beautifully written and well presented article, Katie! janices, Yes I can't imagine spending $120 million on anything, regardless of how much I had.. Interesting painting, but I guess someone had $120 million just burning a hole in their pocket :) I can't imagine spending that much money on a single painting so a copy is sounding pretty great to me. Miaden, sounds wonderful, I like the way you think! Luckily we have you, and art lover who bring art to common people. Miaden, I know that is too much to spend for the likes of this art lover. That's why I featured it here today for the far more realistic price of 40 to 150 bucks for us the money savvy conscious art lover. Love it! One of my friends have the copy of this painting in his house. I fell in love when I saw it for the first time. I knew about it, but it is different when you see it on the wall. But 120 million USD? Isn't that a bit too much? It is just to scream when I think of it! Tolovaj, I agree art in its rawest most simple form is truly great art and something we all relate to.